"They are the heralds of our destroyer. Ushers of this coming storm." A Blade of Crota is a unique Hive Knight that appears in The Dark Below. Blades of Crota appear on Earth and the Moon every ten minutes in public spaces, accompanied by a few small waves of Acolytes. A Blade will also appear after the encounter with Omnigul in Fist of Crota. Blades are always protected by an Arc shield, but are otherwise fairly low-level and easy to kill. Killing a Blade will drop an Ascendant Sword, allowing the player to fight with a sword for a little less than a minute. On rare occasion, they'll drop Husk of the Pit, a common-level weapon that can be upgraded to become Eidolon Ally and then Necrochasm. 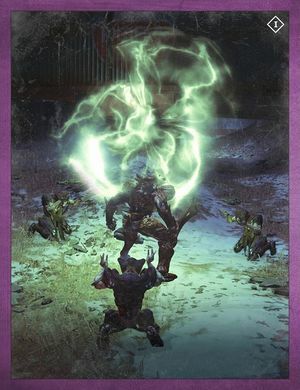 Killing Blades is part of two Bounties from Eris Morn; one requires players to kill three Blades on Earth or the Moon. The other requires players to kill Hive using a Blade's sword on Earth. This enemy was later removed in patch 1.1.2, with the exception of a single Blade found in Fist of Crota.